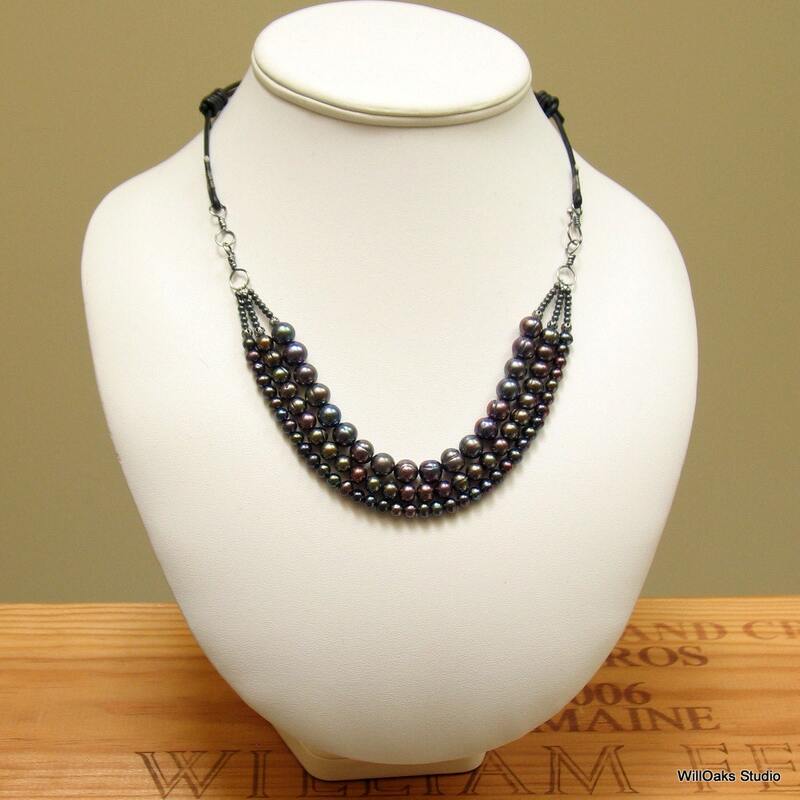 This modern artisan pearl design features multi strand dark peacock pearls and black leather. Graduated in size, 3 strands of pearls connect to hand forged, oxidized sterling links and a hook to close in the front. Fine black leather is connected with binding to the pearl bib. A fresh, contemporary look and versatile, too, as using slip knots in the leather, it's easily worn any length between about 19" and 25 1/2", yet it's easy on, easy off as it hooks closed in the front. I just love peacock finished freshwater pearls and these beauties are nice and dark. 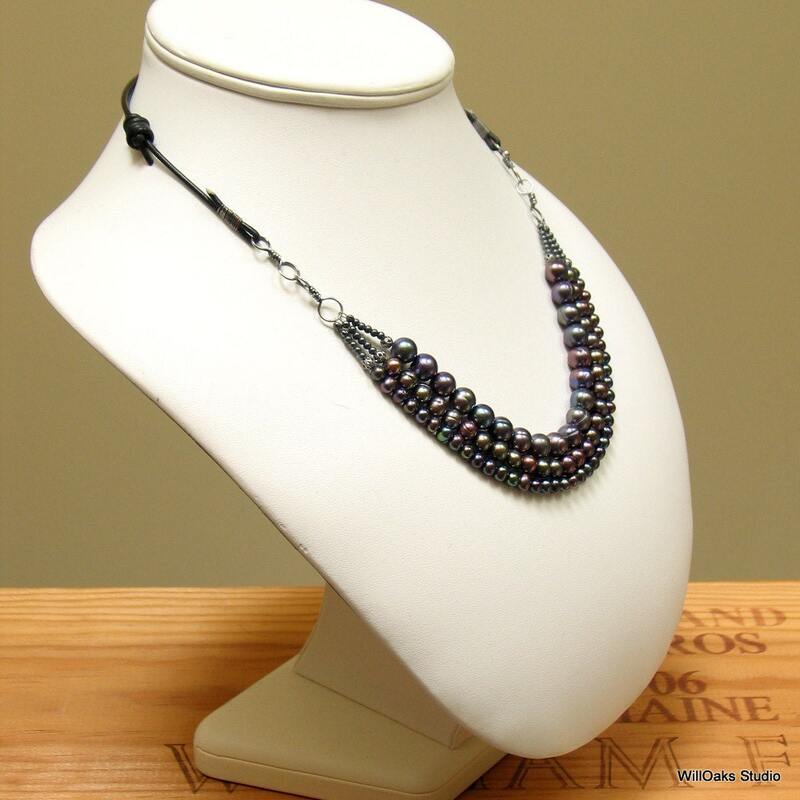 The pearl focal, approximately 9" long, features natural pearls with some ridges and baroque shapes. 8 mm, 6 mm and 4 mm are the approximate sizes of the 3 different pearl lots used. 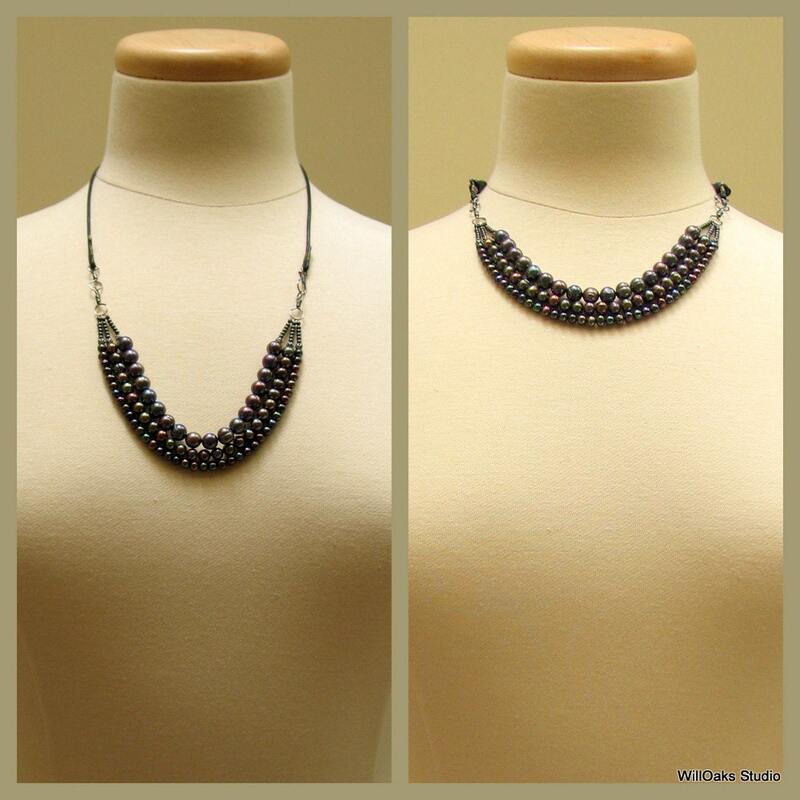 Oxidized sterling 2.5 mm beads are used for the transition from the pearl strands to the handmade links and hook. and another variation on this design but using a single strand of labradorite here https://www.etsy.com/listing/237098577/contemporary-leather-and-beaded-necklace? Splendid coordinated peacock pearl earrings here https://www.etsy.com/listing/525094864/sterling-silver-hoops-and-large? And here https://www.etsy.com/listing/230399767/dark-peacock-pearl-hoops-dark-pearl? And in the peacock version here https://www.etsy.com/listing/519923126/sterling-silver-hoop-dangles-with-large? Or these original dark keishi hoops https://www.etsy.com/listing/97651499/dark-peacock-keishi-pearl-silver-hoops? A limited edition and each necklace is made to order, so it is possible to make some adjustments to lengths, to substitute a different color of leather for black, and to change the metal parts from oxidized sterling to bright sterling silver. Please contact me directly here by convo if you're interested in any of these custom changes and a custom listing will be developed for your order. Comes in my signature box, ready to gift or to enjoy. Because pearls are a natural, variable material and dye lots will vary and I often cannot get more a particular lot. So when they are sold out, that edition is usually complete. 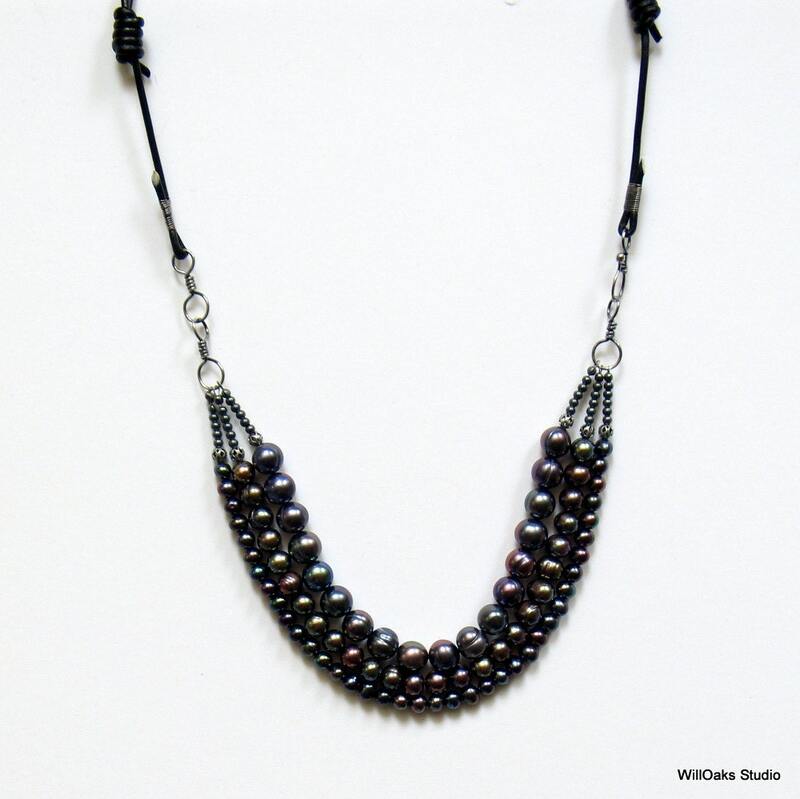 I adore pearls and am usually developing new designs, often bib shapes and other inventive necklaces. 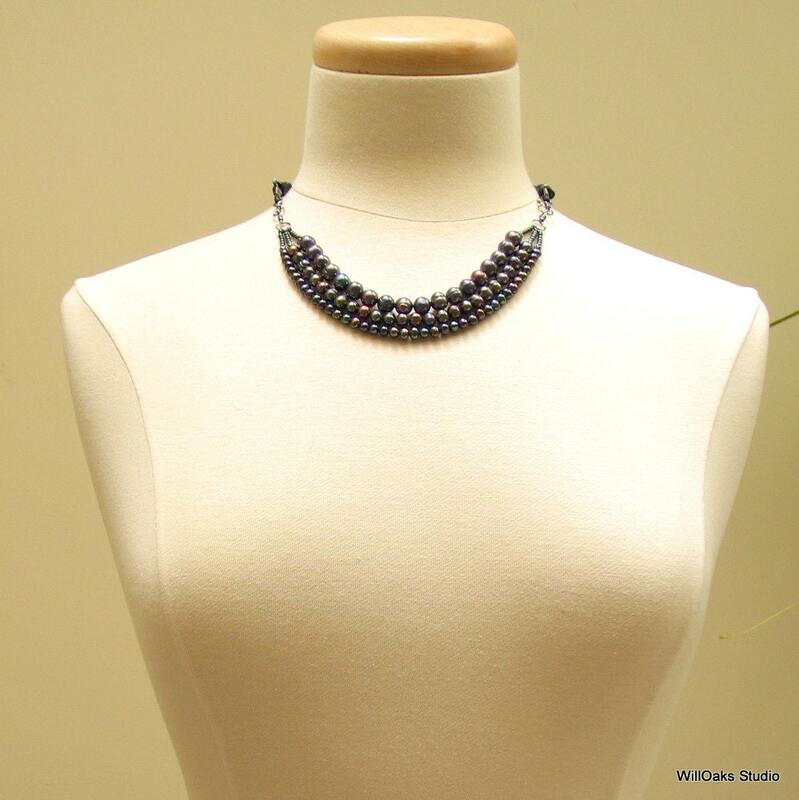 See more pearl bibs listed here http://www.etsy.com/shop/WillOaksStudio?section_id=7631294 and other original necklace designs here https://www.etsy.com/shop/WillOaksStudio?section_id=7593416 Visit the front of my studio here https://www.etsy.com/shop/WillOaksStudio And use the local search bar there to find additional designs that feature freshwater pearls!